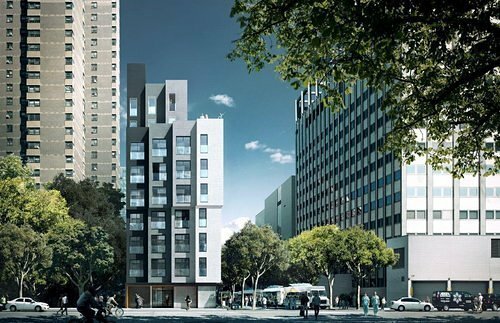 Floor plans for the city's first micro-unit development, Carmel Place have been unveiled, Buzz Buzz Home reports, along with a series of new images of the interiors of the micro dwellings. The floor plans of eight units have been listed so far and range in price from$2,650 per month for a 265 square foot studio to $3,150 per month for a 355 square foot studio. Residents will start moving in as early as February 2016. The development features a total of 55 apartments. Almost 40 percent of those are affordable. Eight apartments have been set aside for veterans. The project, located at 335 East 27th Street is being developed by Monadnock Developmentand has been designed by nArchitects. The building also comes equipped with a ton of cushy services.